Say goodbye to your favorite pre-workout drink. BANG energy drinks from VPX Sports are the hottest new products for athletes everywhere. On every can, you'll find their catchphrase "Potent Brain & Body Fuel" and it gives you just that. Clean energy, laser-sharp focus, and no sugar induced crashes are just a few of the reasons these bad boys are flying off the shelves faster than retailers can keep them stocked. Haven't heard of them? Sound too good to be true? Let me answer your questions. It's an energy drink that's kind of like your typical Red Bull or Monster. It's a perfect substitution for pre-workout supplements or coffee. Anyone! A better question to ask is, "Who isn't this drink meant for?" On the can, you'll find a recommendation for no one under the age of 18 to consume the drink. You also may want to steer clear of it if you're sensitive to stimulants like caffeine. BANG energy drinks contain zero calories, zero carbohydrates, and zero sugar. But what you can find are BCAAs, CoQ10, creatine, and copious amounts of caffeine. These are things athletes often take as supplements. BCAAs are Branched Chain Amino Acids. They are known to stimulate protein synthesis, increase muscle function, decrease your soreness after a workout, and even aid in repairing damaged muscles. Coenzyme Q10 is found in the mitochondria of your cells and sparks energy production. It helps produce energy your body needs for cell growth and maintenance. People often take this as a dietary supplement when they feel tired or lethargic. "The creatine in there is actually something very special...it is the world's only water stable creatine. It is Creatine-Leucine peptide. Think of this...if you mix creatine in water, it sinks and if you mix leucine in water, it floats....if you combine the two into a peptide, it creates a water soluble and water-stable form of creatine. It also has a fatty acid chain that makes it easier to cross the blood brain barrier. The focus of the super creatine is not for muscle function, but for cognition...by combining this form of creatine with caffeine, it works synergistically for mental focus." What kind of BANG flavors can I get? 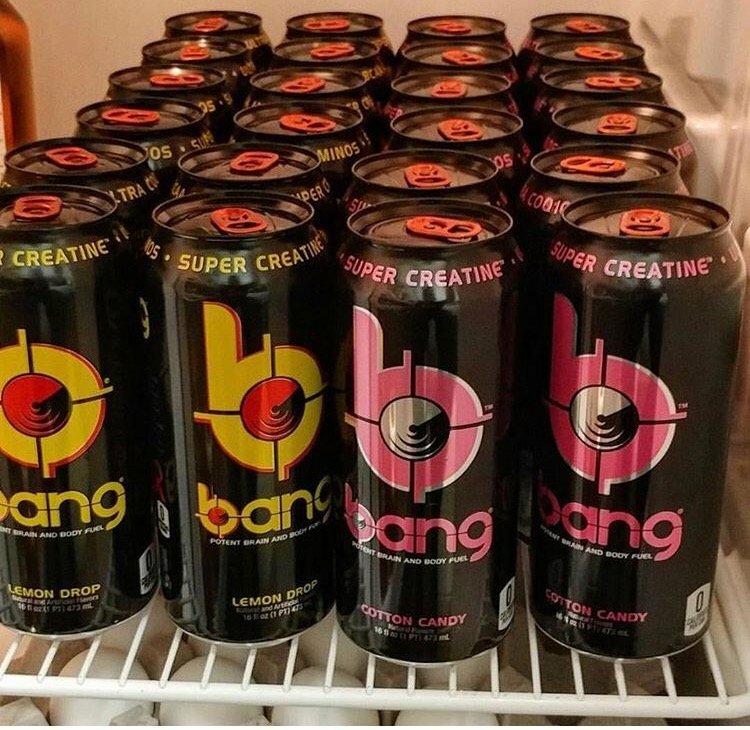 There are currently over a dozen BANG energy drink flavors on the market. Those include Black Cherry Vanilla, Cotton Candy, Purple Haze, Sour Heads, Star Blast, Blue Razz, Champagne Cola, Root Beer, Power Punch, Peach Mango, Rainbow Unicorn, Citrus Twist, Pina Colada, Purple Guava Pear and Lemon Drop. If you prefer to make your drink from scratch, many of these flavors are also available in powder form under the label BANG Master Blaster. 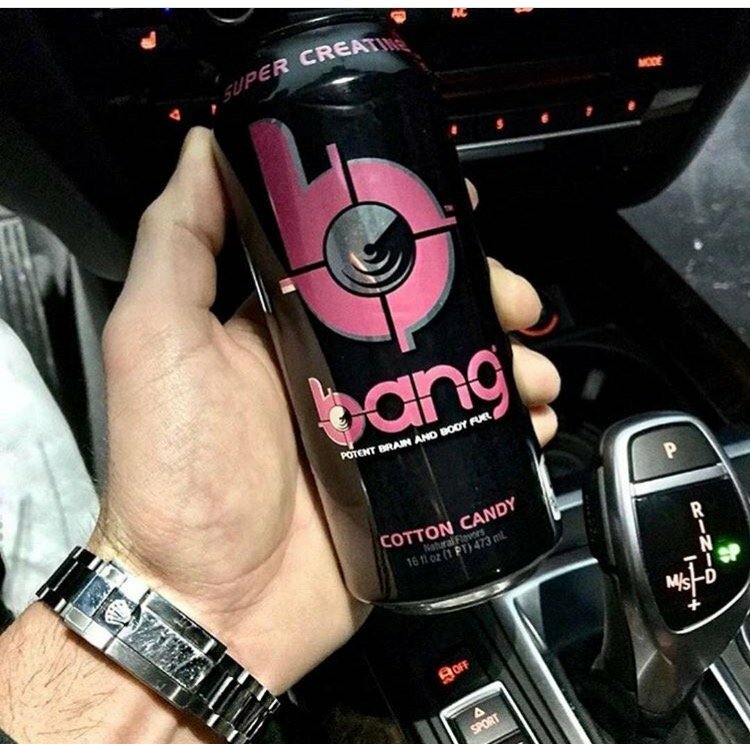 How much caffeine is in one can of BANG? In one can of BANG, you'll be blessed with 300mg of caffeine. This is the equivalent to over three cups of coffee. Yeah, it is. In order for the caffeine in the energy drink to be lethal at any capacity, I would have to drink 30.7 cans. There are two things that come to mind. One is that consumers have no idea how much BCAA's, CoQ10, or creatine is actually in the drink. It could very likely be trace amounts too small to do anything beneficial. 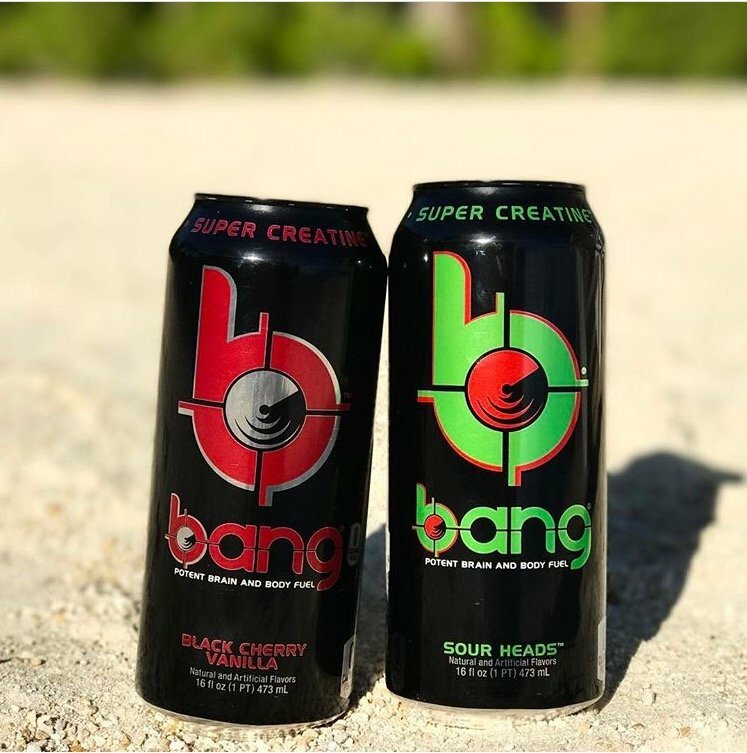 Two, BANG energy drinks do not go through the FDA approval process. Well, out of 124 reviews of the product on Bodybuilding.com, there's an average 9.8 overall rating. Most reviews comment on the quality of the energy, the cognitive focus, and the non-existent crash once the drink wears off. Where can I buy BANG energy drinks? 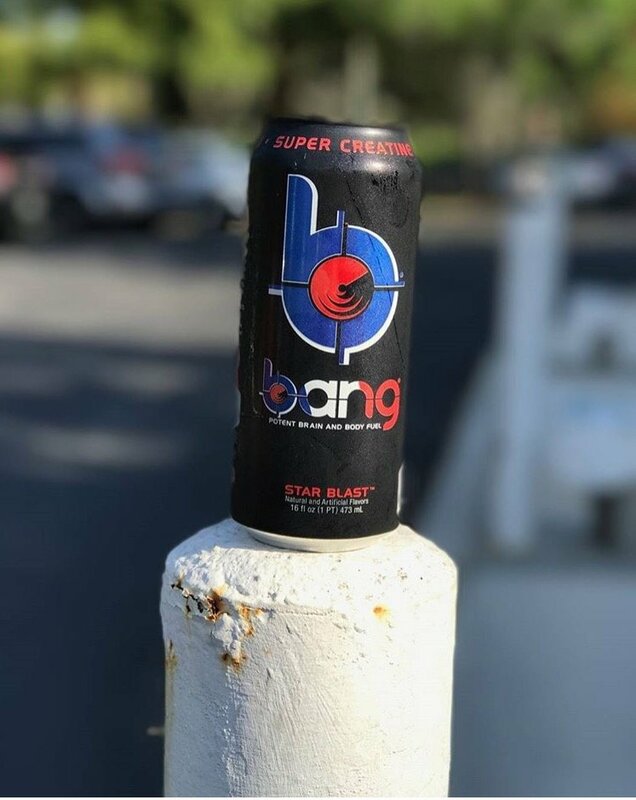 You can find BANG energy drinks at Amazon, your local GNC or Vitamin Shoppe retailers, Bodybuilding.com, VPX Sports' website, some gas stations, and privately owned retailers. This depends on where you make your purchase. 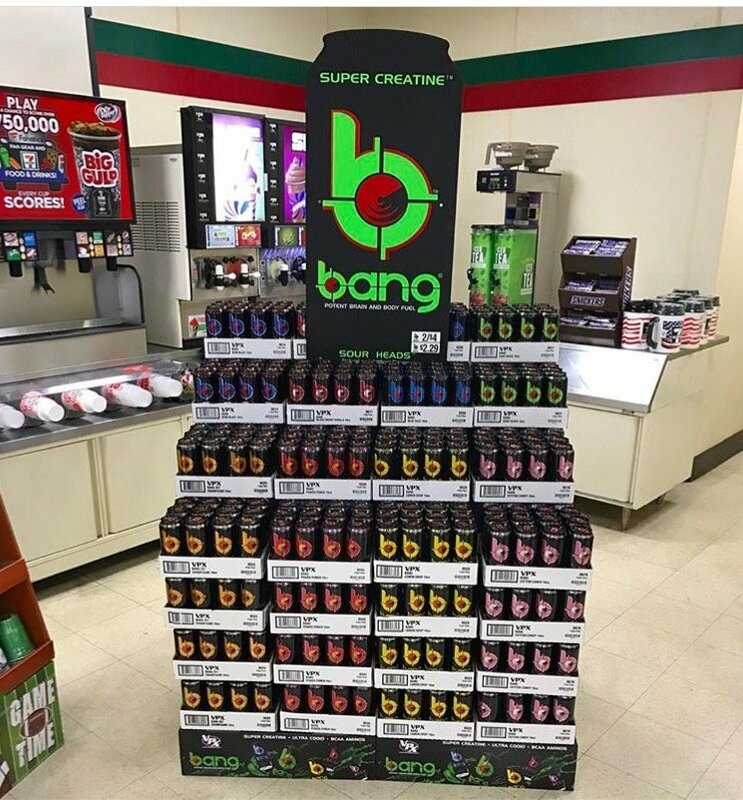 You can typically purchase your BANG energy drinks for about $2.00 per can on Amazon and at your local retailers. The energy drinks are most expensive through the VPX website, where you'll pay about $2.75 per can. How does BANG compare to other energy drinks? 16 oz. BANG (regular): 300mg caffeine, 0g carbohydrates, 0g sugar. Note: Odyssey may earn a portion of purchases made via links on this page. April, coined as a rather "bipolar" month, in which the weather in London is either cold or warm. It is a time of transition where summer slowly but surely encapsulates winter. As a result, rain is the norm and may be viewed as a byproduct of the seasonal passage. One might be lucky to witness a rainbow with its arches passing above each side of the River Thames. A jaw-dropping display of multi-colored flowers blooms all throughout London's parks. Out of all things London has to offer in April my favorite would be the entrance of the butterfly. When I was a little girl I lived minutes walk from Primrose Hill Park, a grassy hill with terrific views of London. I enjoyed dog walks, picnics, and trips to the playground at this park, but nothing made me more excited than the sight of the butterfly. This intricate creature had a certain charm to it which fascinated me! In fact, I was so awe-struck by it that upon my eighth birthday I was gifted a butterfly catching kit. I recall spending numerous hours whether it be on my street or at Primrose Hill trying to catch these speedy critters. However, I never quite could so eventually I gave up and found another form of entertainment. All in all, as the transition from winter to spring, individuals will start to notice the arrival of the butterfly. Although as a child, I never was able to catch one of these magnificent creatures I am now reminded that their sense of lightness and joy represents freedom. Their free spirit and individualism is a reminder to not take life too seriously; and that one should, ultimately, embrace the changes thrown at them. Ultimately, the butterfly flourishes with transformation metamorphosing from a caterpillar to a beautiful winged species. And yes I recognize humans cannot go through metamorphosis, but the butterfly should inspire us to ensure growth in our own lives by accepting change. So go forth and remember it is ok to feel vulnerable as all good things come with time and perseverance.